When you get tired of corn-on-the-cob and succotash, what better way to deal with your excess produce than turn it into ice cream? S likes Jeni’s ice cream so much that I got her the cookbook. 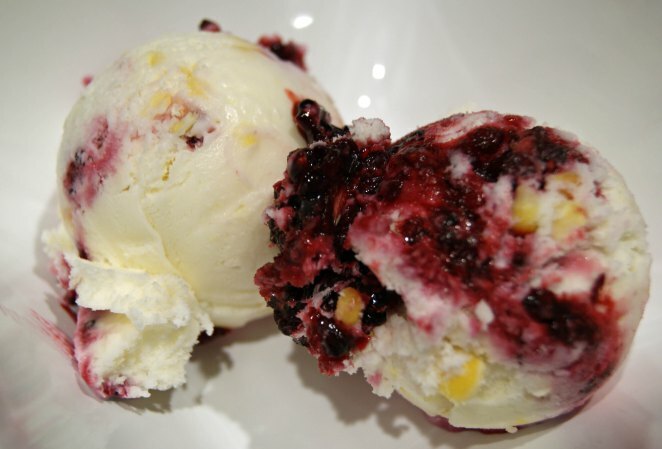 One of their featured summer flavors is sweet corn with black raspberry sauce, which has turned into an annual favorite. Since it can get a bit pricey to buy too much, we decided to just make ourselves a quart. Sweet corn? Check. Black raspberries? Mmm, no, but fresh blackberries work just as well. Cream? Of course. This is a bit more involved than other ice creams, but well worth the end result. To make the sauce: combine the berries and sugar in a small saucepan. Bring to boil and heat until a thermometer registers 220 F (5 to 10 minutes). Remove from heat and chill. To make the ice cream: Mix a 1/4 cup of the milk with the cornstarch in a small bowl until smooth. 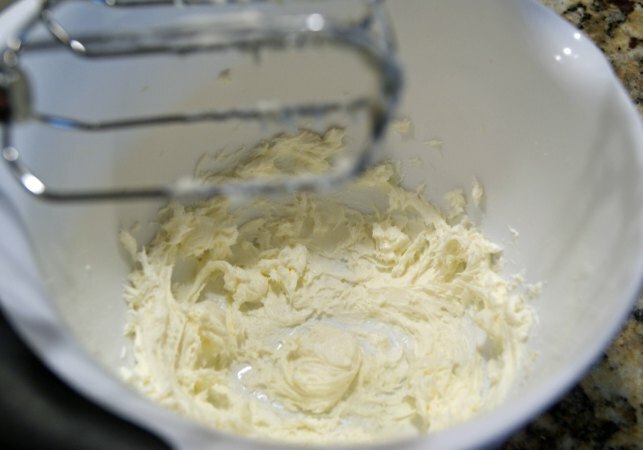 Whisk the cream cheese and salt in a medium bowl, also until smooth. Fill a large bowl with ice and water. Combine the rest of the milk, cream, sugar, corn, and corn syrup in a medium saucepan. Bring to boil for 4 minutes. Remove from heat. At this point, you can strain the mixture to get the corn chunks out (but leave the corn flavor), or just leave it as is. In the saucepan, slowly whisk in the cornstarch mix, bring back to a boil, and cook until slightly thickened, another minute or so. Remove from heat. Slowly whisk the hot milk mixture into the cream cheese until smooth. Here, the original recipe calls for pouring the mix into a bag, then submerging the sealed bag into the ice bath until cold. We just poured it into a stainless steel bowl and refrigerated. Seemed to work out fine. Process the ice cream mix per the directions on your machine. Ours took about 25 minutes to reach a nice consistency. 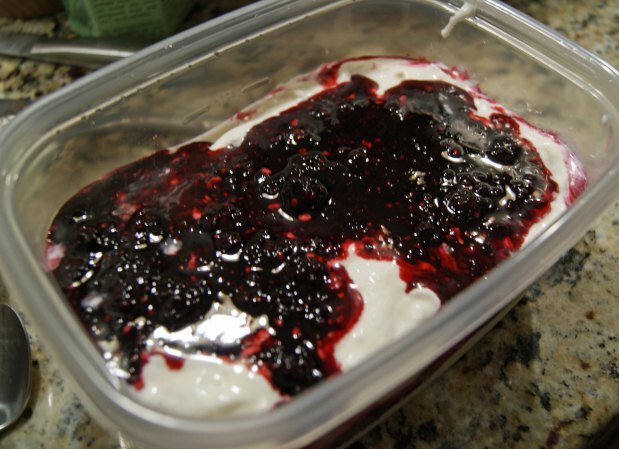 Pack the ice cream into a storage container (2-qt Tupperware or something similar works well), alternating it with layers of the black raspberry sauce – don’t mix them. Press a sheet of parchment paper against the surface and seal. Freeze for at least four hours, or as long as you can stand to wait. The corn is something different for most people, but it really makes an excellent ice cream – it provides a touch of savory to the sweetness and pairs wonderfully with the berries. Enjoy! wow, that sounds good! We’ll have to try it!